China’s military recently disclosed a new photo of its longest-range mobile intercontinental ballistic missile (ICBM), a key element of Beijing’s large-scale strategic nuclear buildup. 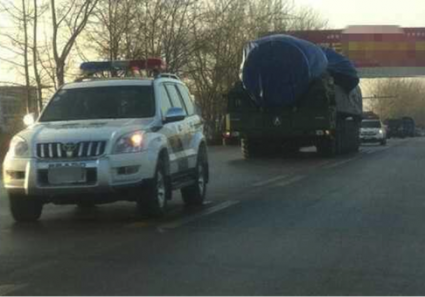 The photograph of the missile reportedly leaving a manufacturing plant in China was posted online Jan. 31 in what a military enthusiast website stated was the transfer of the missile from a factory to a military unit. The photograph shows the mobile missile covered in blue tarp and escorted by security police from the factory. The Chinese military frequently discloses such images online as part of efforts to highlight its nuclear forces, among the most secret elements of Beijing’s military forces. According to the online posting by a user identified only as "witten," the missile was described as the Second Artillery Corps’ Dong Feng-41 (DF-41) ICBM. The bulletin board stated that the missile is considered China’s SS-27 ICBM, a reference to Russia’s road-mobile Topol-M missile. The user stated that the 16-wheeled transporter erector launcher and missile was concealed by the tarp in order to conceal its "infrared defense capabilities." The online report also said the DF-41 is "lower to the ground and shorter" than the SS-27 and was adapted to transit on Chinese "mountain terrain, rail and road tunnels." According to the post, the lower ground profile allows the missile to "to move from tunnel to tunnel during the gap when satellites are out of range"—a reference to China’s 3,000 miles of underground nuclear tunnels and production facilities for nuclear forces. The underground nuclear network was disclosed two years ago as part of a Georgetown University arms control project that labeled the system "the Great Underground Wall" of China’s nuclear facilities. Disclosure of the missile photo came two weeks after the Washington Free Beacon was the first to report on Dec. 17 that China had conducted a second flight of the DF-41. The new missile is considered a major step forward in China’s strategic nuclear arsenal. The missile is difficult to track because of its mobility. It also is assessed by U.S. intelligence agencies to be outfitted with up to 10 multiple, independently targetable reentry vehicles capable of reaching the United States. The flight test was monitored by U.S. intelligence agencies from a launch at the Wuzhai missile launch center in Shanxi province, according to U.S. officials. An earlier flight test took place July 24, 2012. The new mobile missile is estimated to have a range of between 6,835 and 7,456 miles. The Pentagon has yet to list the DF-41 as part of the Chinese strategic arsenal, currently made up of a number of older silo-based missiles and newer DF-31 and DF-31A mobile missiles. The Air Force National Air and Space Intelligence Center in a report made public in May did not name the DF-41 but referred to the development of a new long-range ICBM with multiple warheads. "China may also be developing a new road-mobile ICBM capable of carrying a MIRV payload, and the number of warheads on Chinese ICBMs capable of threatening the United States is expected to grow to well over 100 in the next 15 years," the report stated. Officials said the reference to the new ICBM was meant for the DF-41, whose existence remains secret within the U.S. government. A Chinese language banner on the road where the photo is taken has been censored, suggesting the banner may be related to the missile factory or the military unit receiving the missile. The censorship also indicates that the photo is likely an official leak. China analysts say the People’s Liberation Army frequently discloses new or developmental weapons systems, including stealth jets and unmanned aerial vehicles, as part of preparation for a later formal unveiling of the weapons systems. Former military intelligence official Larry Wortzel told a congressional hearing recently that the DF-41 is an element of China’s strategic nuclear buildup. "China is enhancing its nuclear deterrent capability by modernizing its nuclear force," Wortzel said Nov. 20. "It is taking measures such as developing a new road-mobile intercontinental ballistic missile, the DF-41. This missile could be equipped with a multiple independently targetable reentry vehicle (MIRV), allowing it to carry as many as 10 nuclear warheads." Wortzel also said it likely China could outfit the DF-41 with penetration aids—decoys and other simulated warheads designed to fool U.S. missile defense sensors.